At the end of 2008, the FAA says there were 613,746 pilots in this country, including 80,989 student pilots. That's a lot of aviation ambassadors out there, whole legions of enthusiasts who should be talking about general aviation 24/7. The way I see it, unless a person has some sort of diagnosed fear of flying, just about everyone wants to learn to fly, and is jealous of those who already have earned that privilege. So when you let them know you are a pilot and they want to learn more, it gives you a golden opportunity to tell them about the joys of flight, about the almost surreal sensation we aviators enjoy each time we act as PIC and lift a flying machine skyward. And once you've mastered the art of talking up GA in the checkout line at the local Piggly Wiggly, why not take that to the extreme and offer to speak at a middle school and fire up a bunch of fresh minds about flying? Or maybe your city's Chamber of Commerce would welcome a pilot to speak at a luncheon about using GA as a business tool. Former Astronauts James Lovell, Walter Schirra and John Young are three aviators who were also members of Toastmasters International, a great organization known throughout the world as the best resource for teaching regular people to become great speakers. I am also a long-time Toastie, and can attest that this inexpensive, fun and seriously effective program works like magic, and can teach any pilot to take command of a room in any situation. When you become a seasoned Toastmaster-trained speaker, you will be able to talk about flying any time, anywhere, to any group. 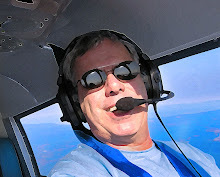 For very little time and money, the program can teach pilots public speaking skills that allow you to assess your audience, command their attention, keep them enthralled, make them hang on your every word, and close the deal with a powerful conclusion. When a trained Toastie pilot ends his/her presentation, there will be a decent percentage of people in the room who will have been persuaded to seek out a flight school and investigate the possibilities of taking that important first flight lesson. 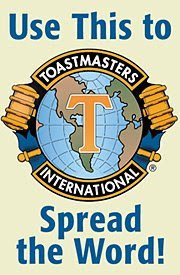 If you want to learn more, here is the Toastmaster's International world site, and here is a place where you can find a meeting in your area.